The Natural Pain Cream quickly reduces pain and inflammation from muscle, joint, and nerve pain. Naturally occurring cannabinoids of CBD and THC act together to effectively alleviate the symptoms of low back and neck pain, headaches, arthritic and nerve pains. Our creams are formulated to provide effective localized relief while incorporating a luxurious feel and the cooling essential oils of Peppermint, Lavender, and Eucalyptus for maximum relief. Dr. Kerklaan Therapeutics range of products offer natural alternatives when looking for relief from pain, inflammation and muscle tension. Utilizing active oils extracted from the cannabis plant, our topicals provide both effective and natural solutions. Our products have been professionally formulated to perform to the highest standards. Strong anti-inflammatory effect Excellent analgesic pain reliever Effective anti-spasmodic muscle relaxant Naturally occurring compounds work with the body’s natural systems No side effects; non-psychoactive All of our formulas are pH balanced, paraben and sulfate free, and cruelty free. The Natural PMS Cream helps alleviate the burden of menstrual pain. Naturally occurring cannabinoids of CBD and THC act together to effectively soothe muscle tension, ease cramping and reduce discomfort. Our creams are formulated not only for localized pain relief but also for the added benefit of moisturizing and nourishing the skin. The added fragrance of Vanilla adds to the soothing effect. 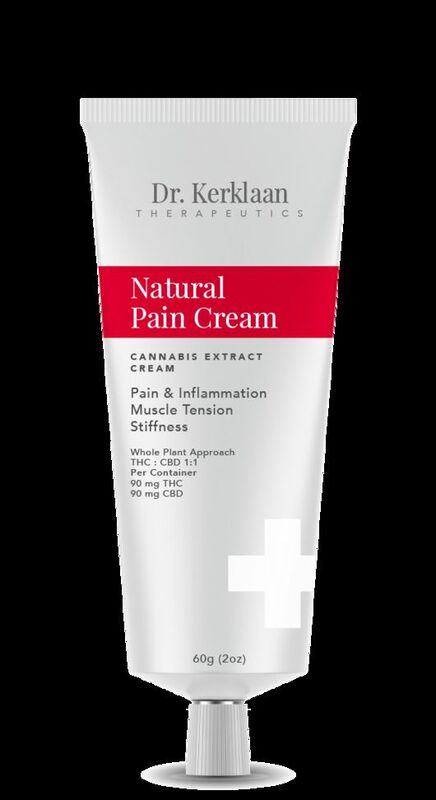 Dr. Kerklaan Therapeutics range of products offer natural alternatives when looking for relief from pain, inflammation and muscle tension. Utilizing active oils extracted from the cannabis plant, our topicals provide both effective and natural solutions. Our products have been professionally formulated to perform to the highest standards. Strong anti-inflammatory effect Excellent analgesic pain reliever Effective muscle relaxant Naturally occurring compounds work with the body’s natural systems No side effects; non-psychoactive All of our formulas are pH balanced, paraben and sulfate free, and cruelty free. Natural Skin Cream helps to reduce skin irritation, inflammation and immune reactions. Naturally occurring cannabinoids of CBD and THC act together to effectively soothe painful, irritated and inflamed skin. This topical cream targets skin irritations such as burns and rashes, itching and dermatitis. Our creams are formulated to be hypoallergenic, hydrating and fragrance free. 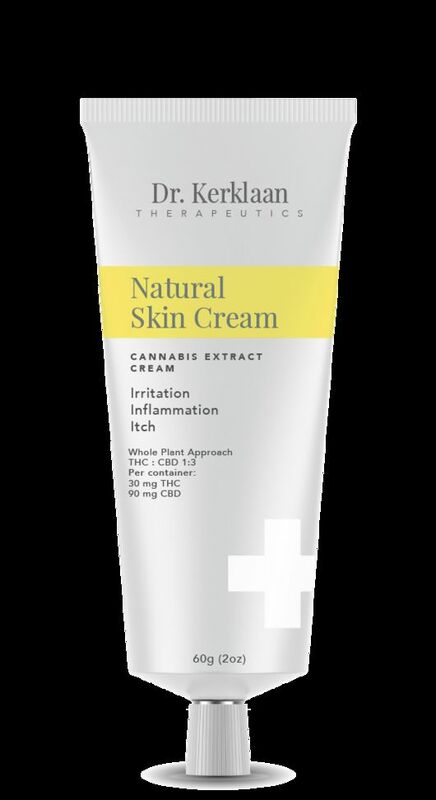 Dr. Kerklaan Therapeutics range of products are natural alternatives to reduce pain or distress to localized areas. Cannabis topicals are both effective and natural solutions for treating various symptoms which our products have been formulated to target. The cannabinoids of THC and CBD are beneficial for pain management and are non-psychoactive in our topicals. Hypoallergenic formula Hydrating Fragrance free Strong anti-inflammatory effect Effective anti-bacterial for skin irritations Naturally occurring compounds work with the body’s natural systems No side effects; non-psychoactive All of our formulas are pH balanced, paraben and sulfate free, and cruelty free. The Natural Sleep Cream helps reduce stress, anxiety and tension leading to a better night’s sleep. Naturally occurring cannabinoids of CBD and THC act together to effectively soothe muscle tension, restless legs, and headaches. Our creams are formulated to provide effective localized relief while incorporating a luxurious feel and the calming fragrance of Citrus and Lavender. Dr. Kerklaan Therapeutics range of products offer natural alternatives when looking for relief from pain, inflammation and muscle tension. Utilizing active oils extracted from the cannabis plant, our topicals provide both effective and natural solutions. Our products have been professionally formulated to perform to the highest standards. Relaxing and calming effect Excellent analgesic pain reliever Effective anti-spasmodic muscle relaxant Naturally occurring compounds work with the body’s natural systems No side effects; non-psychoactive All of our formulas are pH balanced, paraben and sulfate free, and cruelty free.